Here it is! 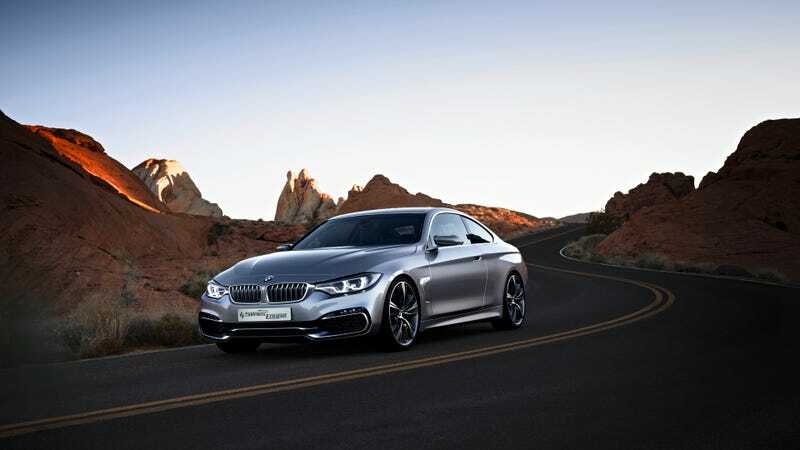 The BMW 4 Series Coupe. Think of it as a more affordable version of the 6 Series. While officially still a Concept, we all know that is just a funny codename BMW is using for their production ready new models. Basically, the 3 Series Coupe has grown up, and left the family to persue a new career. To replace it they've created the 4 Series. Even number = coupe (or coupe-like sedan) and odd number = sedan (or bloated crossover-type thing). Get it? But this seems like more than just a name change. Like the 2012 BMW 335i, this new car is longer, wider and lower then the one it replaces. The design is using all the usual forms from the current BMW lineup, with a long sweeping bonnet, a much widened kidney grill, and a futuristic take on the classic round headlamps with those hexagonal LEDs. The rear wheel arches mark the widest point of the car, which makes the body look dynamic even standing still. The air intakes of the side of the bonnet suggest some serious performance as well, while also channeling the incoming air around the outside of the wheels, reducing drag. At the rear, it's more about elegance than agression as the two L-shaped rear lights flow nicely with the overall lines, while the apron makes the integrated double exhaust pipes look even bigger. I think it looks fantastic and will give the A5 a run for its money. The interior is wrapped around the driver in the usual Bavarian fashion, but luxury plays the most important role as everything is covered with quality leather, aluminium and wood. Super lux. Engine-wise, there will be two options: As a base, you can have your 4 Series with the 2.0-liter twin-turbo in-line 4-cylinder, but for the power hungry, a new version of the twin-turbo in-line 6-cylinder will be available when it goes into production next spring. Both of them can be ordered with a manual or the 8-speed automatic transmission, and there will be an xDrive version for the skiers. The open-top version is set to follow later next year.